I was marbling/dip dyeing some paper the other day. No fuss for me. No turps or shaving cream. I just tipped a glass of water into a cookie tray, blobbed some acrylic paint in, swirled it with a chopstick, and dropped a sheet of blue paper in, face down. I then flipped the paper over, rested it on a clean teatowel, and allowed it to dry. I think it's pretty. All sort of soft and reminiscent of a Monet painting. Once dry, I cut it in half, stuck it together with tape to form a long 'band', and wrapped it round the so called Belly of my gift. A sliver of toning ribbon, adds a little flourish. 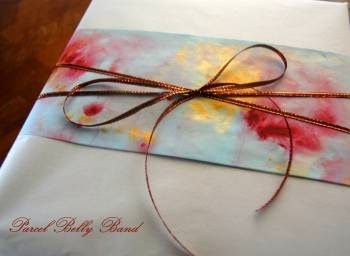 I love the idea of Belly Bands. They just add a little extra anticipation to the unwrapping and unveiling. So, do you Belly Band? Or is it all too much bother?